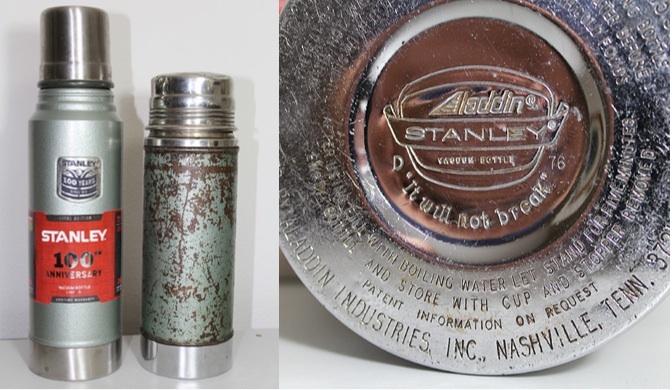 The older Stanley thermos in the photo is my traveling companion of 35 years. It's been with me through decades of business travel across the country and never let me down. When my wife and I got married 35 years ago, we registered at the Ace Hardware store in Streator, IL. I didn't know anything about registering for wedding gifts. Mary told me to pick out something I could really use. I fell in love with a beautiful Stanley thermos. Mary and I and that thermos have been together ever since. When I look at the photo, all that wear and tear feels like an entrepreneurship timeline to me. I carried that thermos everywhere for a couple of decades while we built and grew Banner Graphics. I carried it everywhere for a decade as we developed our inventions, launched and grew SmartSkim. I've carried it with me for 5+ years through the startup of Business Diligence and now our Iowa County Area Economic Development Corp. and the Wisconsin Innovation Kitchen. In the photo of my old thermos, I think I can still feel all those dents and scrapes, hard won from entrepreneurship efforts across different decades and industries. I salute the great Stanley thermos. The motto stamped into the base of my old thermos says 'It will not break'. Great products and great stories can say that. Thanks to daughter Anne for my new Stanley thermos for Father's Day! The 100 Year Anniversary edition of my old friend. I've used my first thermos for more than a third of the 100 year history of this great product.